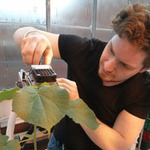 I'm currently pursuing a PhD with Sean Thomas at the University of Toronto, Faculty of Forestry investigating plant growth and physiological responses to biochar in temperate, boreal, and tropical systems. Serious curiosity and inquiry on the nature of plants began very early in the garden. Much time was additionally spent in Ontario's temperate mixed-wood forests and woodlots. Silviculture was implemented as a means to heat the house, and the forest served as a brilliant recreational space. As a "grown-up" I'd describe myself as a curious plant and forest ecologist. I'm pre-occupied with fighting climate change and restoring industrialised landscapes. Field update 2: First experimental forest in Bangladesh! Update from the field: Char and "cha"
Learning about tropical forest ecology and conservation in Malaysia -- departing for Bangladesh! Our project is featured in U of T news! Biochar increases growth of tree saplings in our preliminary nursery experiment in Bangladesh! Very big thank you to Unique Restoration http://www.uniquerestoration.ca/ for their very generous contribution to this project! Thank you to Valerie and Terry Cowley for their contributions. Thank you, Jarmila. It's with your support we are able to make a difference!